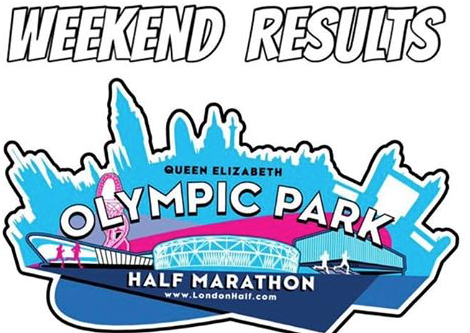 HARLOW Running Club were represented at Sunday’s Queen Elizabeth Olympic Park Half Marathon by sixteen runners, one of whom finished first in their age category and five others achieved a personal best time for the distance (PB). First home was Martyn Coulter in 142nd place out of 4054 finishers in a PB time of 1hr 28min 32sec. He was followed by Andy Kitson 144th in 1.28.32, Paul Schroder 349th in 1.34.21(PB), Carinne Jay 669th and 1st Female Vet 50 in 1.40.12, Leanne Bennett 810th in 1.42.18, Kerry Mavris 1020th in 1.44.59(PB), Alison Wilkinson 1578th in 1.51.53, Sam Carter 1854th in 1.55.25, Dave Goosetree 1945th in 1.56.28(PB), Wendy Schroder 2209th in 1.59.12, Laura Prime 2221st in 1.59.20, James Keys-Kidd 2619th in 2.05.18, Tracy Greenall 2987th in 2.11.36, Teresa Stickland 3061st in 2.13.11, Emily Clibbens 3291st in 2.17.49(PB) and Alan Chatterton 3464th in 2.22.32. Meanwhile on Saturday at Harlow parkrun Martin Westley was first finisher out of 191 finishers in 18.32. He was followed home by Andy Kitson 4th in 19.50, Michael Woodruff 5th in 19.52, Colin Baker 6th in 20.49, Alan Broughton 7th in 21.30, Andy Terrell 8th in 21.27, Jamie Jephcott 12th in 22.11, Allison Beeton 13th in 22.13, Terry Ridge 17th in 22.55, John Bull 19th in 23.07, Bobby Draper 21st in 23.30, Robert Scott 25th in 23.46, Marc Witham 27th in 23.52, Steve Cowlin 28th in 23.52, Andy Smith 31st in 24.11, Ben Usher 33rd in 24.20, Paul Dixon 38th in 24.35, Jim Bates 48th in 26.15, Vincent Martin 51st in 26.40, Laura Prime 70th in 28.12, Louise Peacock 77th in 28.45, Austin Nyamande 80th in 28.53, Liz Roberts 87th in 29.41, Michael Robey 91st in 29.46, Graham Saville 92nd in 29.50, Andrew Smith 94th in 29.58, Alison Bull 103rd in 31.13, Debbie Cooper 104th in 31.26, Hossein Erfani 113th in 32.06, Julie Bradley 114th in 32.09, Jason Pite 129th in 34.07, Pauline Weirich 155th in 37.09, Spencer Brooks 166th in 39.52, Sharon Brooks 176th in 42.59 and Karen Kitson 178th in 43.24. At Hackney Marshes parkrun Paul Schroder finished in 42nd place out of 376 finishers in 20.03 and Wendy Schroder was 182nd in 25.01. At the Gunpowder parkrun at Waltham Abbey Jon Waight finished in 8th place out of 230 finishers in 22.18, Dionne Jones was 38th in 23.58, Kerry Mavris 55th in 25.16, Robin Lozeau 71st in 26.27, David Page 76th in 26.41, Janice Page 90th in 27.40, Alan Wellbelove 104th in 29.05, Teresa Stickland 128th in 30.07 and Brenda Clayton 169th in 32.38. At Rutland Water parkrun Martin Elven finished in 44th place out of 239 finishers in 24.41. At Bishop’s Stortford parkrun Holly Davis finished in 70th place out of 327 finishers in 25.03(PB), Justin Patten was 81st in 25.31 and Helen Brunton 327th in 60.53. At Brandon parkrun in Suffolk Darren Rautenbach finished in 31st place out of 126 finishers in 25.58. At Maidstone parkrun Hazel Kurz finished in 157th place out of 425 finishers in 27.13. At Penrose parkrun in Cornwall Joanne Mills finished in 147th place out of 208 finishers in 32.38 and Peter Mills was 167th in 34.30. At Alexandra Palace parkrun Sara Coombe finished in 337th place out of 340 finishers in 45.54.